Disney•Pixar’s “Coco”—the story of a 12-year-old aspiring musician’s extraordinary journey to the magical land of his ancestors—won a 2018 Golden Globe Award® for Best Animated Motion Picture, topped the domestic box office Thanksgiving holiday weekend, became the highest grossing film of all time in Mexico, broke records in China and earned widespread praise, receiving 96 percent from critics and 97 percent from audiences on Rotten Tomatoes. 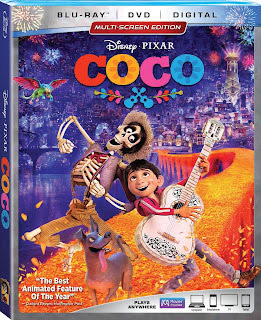 Now this vibrant tale filled with love and laughter arrives home Digitally in HD and 4K Ultra HD™ and on Movies Anywhere on Feb. 13, and on 4K Ultra HD,™ Blu-ray,™ DVD and On-Demand on Feb. 27. Movies Anywhere simplifies and enhances the digital movie collection and viewing experience by allowing consumers to access their favorite digital movies in one place when purchased or redeemed through participating digital retailers. Movies Anywhere brings together the movies from Sony Pictures, Twentieth Century Fox Film, The Walt Disney Studios (including Disney, Pixar, Marvel Studios and Lucasfilm), Universal Pictures and Warner Bros. Participating digital retailers at launch are Amazon Video, Google Play, iTunes and Vudu. Movies Anywhere offers a library of over 7,300 digital movies at launch, including new releases, and will continue to expand the consumer experience as more content providers, digital retailers and platforms are added. Using the free Movies Anywhere app and website, consumers can connect their Movies Anywhere account with participating digital retailers and enjoy their favorite digital movies from the comfort of their living room and across multiple devices and platforms, including Amazon Fire devices; Android devices and Android TV; Apple TV; Chromecast; iPhone, iPad and iPod touch; Roku® devices and popular browsers. Consumers can also redeem digital copy codes found in eligible Blu-ray and DVD disc packages from participating studios and enjoy them through Movies Anywhere.